The best-selling underwater light show is now solar powered! The Solar Underwater Light Show converts any pool into a brilliant light display that is great for evening parties or for creating a peaceful environment while relaxing poolside. The party starts when the disco-effect lights come on. 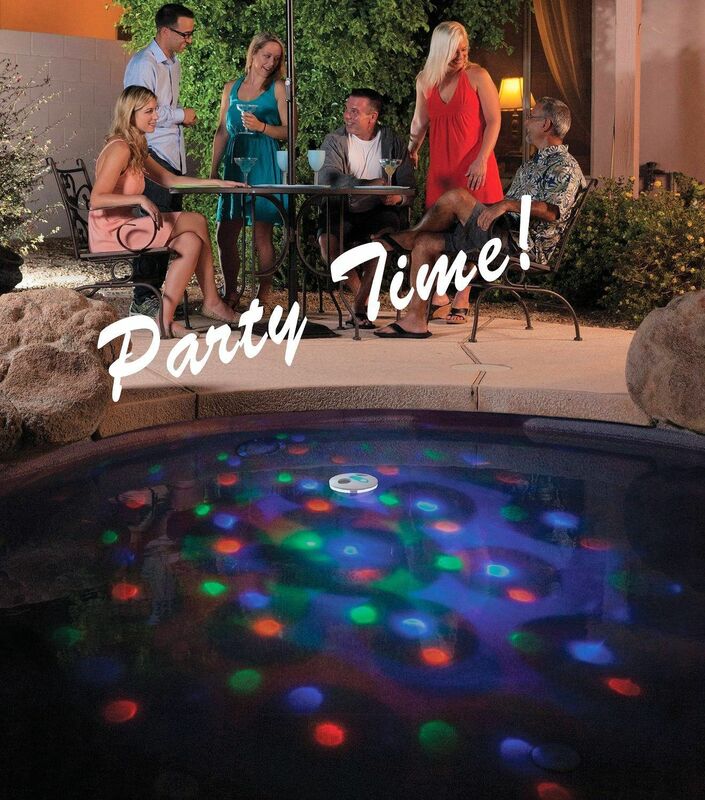 Six ultra-bright, multi-colored LED lights give up to a 3m lighting pattern in most pools. Advanced solar cell rechargeable batteries will charge in full sun or under the clouds providing 6-8 hours run-time on full charge. Completely sealed unit means no leaks from replacing batteries. This versatile unit can also be used outside of the pool. Simply use the integrated hanger to suspend from patio cover, umbrella, tree or ceiling fan to create a disco ball effect. BUY MORE THAN ONE AND ONLY PAY $40.00 EACH! Zero maintenance: Powered by high quality solar cells. Does not require batteries. Set and forget: The in-built light sensor automatically turns it on during the night. During the day it simply recharges with the sun's light. Use it out of the water: Its integrated hanger allows you to use it creatively in an umbrella, patio cover, tree, ceiling fan, kids bedroom, etc. Bright LED Lights: It is equipped with 10 ultra bright LED lights which can reach up to a 4.5m diameter in the pool. It delivers up to 6 hours of lights effects. Easy to use: Just one push button turna it on or off. It is that simple. Entertaining: Can run 7 different light show programs, including random ones, giving a feel of movement and life. Integrated hanger: Hangs outdoors for out of water fun!